For the first time since the 1980s, intensive excavation is underway in the center of Chichen Itza's Grand Plaza, the giant platform that supports many of the ancient cities' greatest monuments: El Castillo, the pyramid; the Great Ball Court, the largest of its kind in the world; and the Temple of Warriors. Underneath the Grand Plaza archaeologists have found ancient structures that predate all the monuments we know today. They've found perfect walls, at least two older platforms, and, possibly, answers to how Chichen Itza became the great capital of the Maya. Itza. Photo courtesy Tony Rojo. 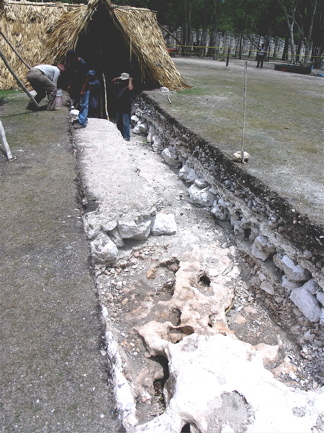 In the spring of 2009, the Instituto Nacional de Antropologia e Historia (National Institute of Anthropology and History or INAH) began a program of excavation next to the pyramid El Castillo on the Great Plaza, the main platform at Chichen Itza. An international team of archaeologists and archaeology students, supervised by INAH, and an extensive crew of laborers excavated some eight trenches between the giant pyramid and the Temple of Warriors. 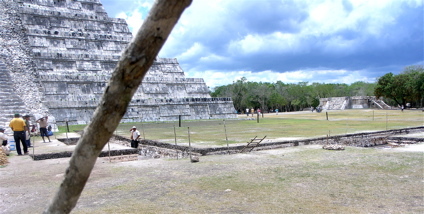 According to archaeologist Rafael Cobos, member of INAH Archaeology Council and supervisor of the project, the aim of the project was to determine the origins, development, and architectonic evolution of three of the most emblematic structures at Chichen Itza, El Castillo, the Temple of Warriors, and the Court of 1,000 Columns. What they found was a substructure that predates all three of those structures and is estimated to be from between 8th and 9th centuries. The excavation team has uncovered 12 linear meters of the substructure, including a building corner, a cornice and a sloped wall. "It is not known where it ends or if it has a staircase," reports Cobos. Satellite view of Chichen Itza Great Plaza where INAH is currently excavating. 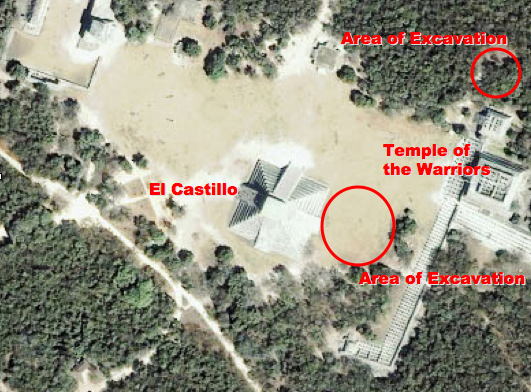 The area next to El Castillo, the pyramid, is where the substructure was discovered. What follows is a series of photographs taken in July of the excavation at Chichen Itza. 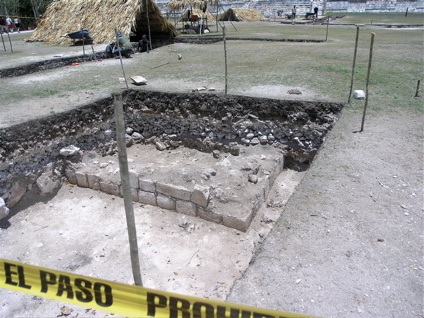 Almost every trench now open next to El Castillo exposes different structures. Two or three pairs of trenches had very similar structures but each of the others had features that were unique from the others. Based on the excavation, it appears there was an original platform, which at some point was covered by another, broader platform, and in turn that was later covered by the platform of the Great Plaza of today. Some of the photos show all three platforms; some show just the top and middle platform and the wall that surrounded it. This photograph shows a partial view of the trenches and how they relate to El Castillo. This shows the end of the substructure. The trench closest to El Castillo pictured above has a bench or shelf-like structure with a plastered forward (vertical) face about 60 centimeters high, running parallel to El Castillo and no vertical or sloped finished-stone wall. 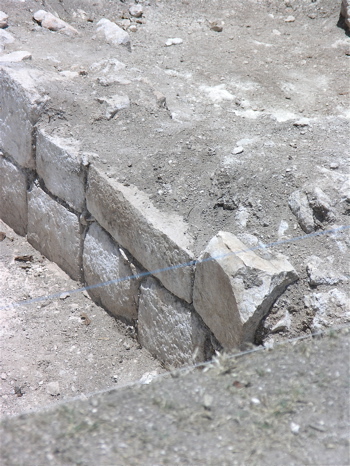 Another trench about 15 meters further from El Castillo reveals plastered layers as well as a short, 2-layered, vertical finished-stone wall and no vertical plastered faces. Compare with a third trench, an intermediate distance from El Castillo, that was dug twice as deep (approximately 3 meters) and has a unique 1.5 meter high wall of nicely-finished stones that sloped gently away from El Castillo. The sloping wall clearly appears to be one of the older structures in that area of the platform, if one assumes depth characterizes relative age (that is, deeper equals older while shallower equals more recent). This type of wall is similar to the north wall to the current Great Plaza platform, which was restored a decade ago, perhaps indicating that this, too, was once the edge of a platform. In the photo above, the long horizontal trench runs north-south, parallel to the east side of El Castillo. The section that has a ladder protrucing is where the sloped wall was uncovered. The trenches to the south, although collinear, contain no part of the wall but instead bedrock. Why would the wall end so abruptly? The answer may have been discovered more than a decade ago before a single shovel was put in the ground. According to INAH, the discovery of the substructure was not random luck, but based upon an excavation program in which a series of 2-meter by 4-meter trenches were dug to a depth of 4 meters. More importantly, however, is that the excavation program corresponds to findings of earlier GPR surveys of the area. In 1993 and in 1997, a team from the United States, headed by archaeologist Lawrence G. Desmond and geophysicist William A. Sauck, performed GPR surveys of Chichen Itza in the same area where INAH excavated. David Maki, left, and Tim Tucker guide the 60 Mhz antennas on the east side of El Castillo. The GPR unit is in VW van. The area being surveyed is where a subsurface trench was detected. Photo by Lawrence G. Desmond, 1997. A buried sacbe (causeway) was detected beginning near the southeast corner of the Platform of Venus and trending across the plaza to the southwest, and then passing to the west of the Castillo Pyramid. This sacbe would predate the construction of the plaza. The north/south survey lines in the Great Ball Court showed a shallow depth of plaza, less than a meter to bedrock, near center court with depth increasing to the north to a maximum of 3.5 meters, then shallow again at about 40 meters north of mid-court. Also, noted about 10 meters from the west wall of the north end zone was a near surface indication of active cavity formation at great depth. It took the form of a depression at the surface with a loss of amplitude of the bedrock reflection with steeply dipping, centrally convergent reflections below this zone similar to GPR patterns indicative of vertical piping in limestone noted by Benson and Yuhr (1992). The Desmond/Sauck GPR project at Chichen Itza in 1997 resurveyed the "anomalous culture feature" adjacent to the east side of the Castillo, and found that it extended south past the east stairway with a slight turn in that direction, and further into the Great Plaza. Based on the followup survey that showed a much more significant feature, Desmond hypothesized that it might have been a processional ramp dug into the pre-existing plaza to access a tomb or chamber under the pyramid via the east stairway. An anomalous cultural feature cut into the bedrock about 20 meters east of the Castillo Pyramid was noted from downward and inwardly curving patterns in the radar profile (actually diffractions)--typical of an excavated trench or widened natural fissure which may be connected to a deeper cavern system (Figure 3). It parallels the pyramid and is about 10 meters east-to-west and 30 meters north-to-south. Removal of the soil from the bedrock, and excavation into the bedrock by the Maya may be the cause of the disruption of the reflected radar pulse. Such an excavation by the Maya would have been carried out prior to building of the plaza unless it was dug through three meters of fill to reach the bedrock. But, four east/west survey lines across the feature show a change from a double pulse reflector to at least a triple pulse and thicker reflectors on the east side of the feature. This layering effect has caused us to hypothesize that the soil excavated from the feature was piled on the east side. This "anomalous cultural feature" appears to be the slanted wall, which is roughly where the GPR team said it would be. Archaeologists from the National Institute of Anthropology and History (INAH) found a substructure near El Castillo and Templo de los Guerreros, in Chichen Itza, Yucatan, more than 1,000 years old. 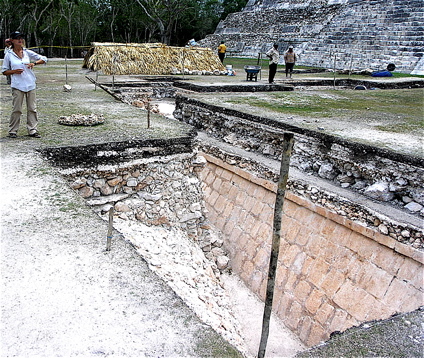 The construction corresponds to the period previous to the site splendor, between 8th and 9th centuries, and brings in important data regarding Maya urbanism. This discovery took place during the research project conducted by INAH, which excavations are oriented to know architectonic features, archaeological contexts and information about terrain's unevenness. 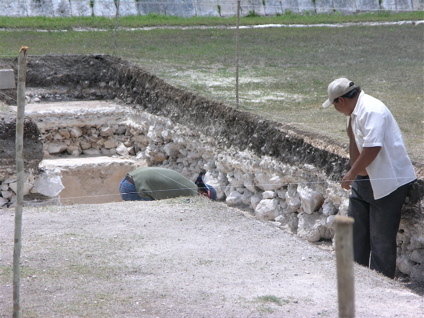 Archaeologist Rafael Cobos, member of INAH Archaeology Council and responsible of the project, informed that works began with the aim of understanding relations and origins of El Castillo, Gran Columnata and Templo de los Guerreros, 3 emblematic buildings at Chichen Itza, excavating the surrounding space to determine their development and architectonic evolution. To present, 12 linear meters of the substructure have been found. "It was definitively built 100 years before El Castillo or Templo de los Guerreros, directly settled on parent rock; until now, a building corner, a cornice and a slope wall have been identified; the southeastern part might have been discovered as well, but it is not known where does it end or if it has a staircase". 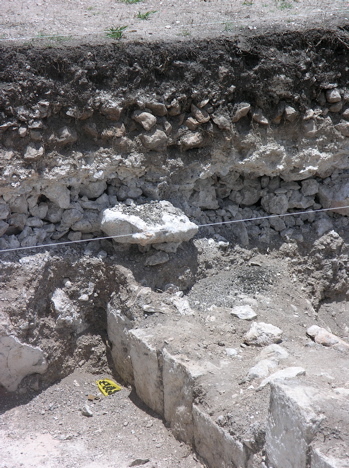 A great amount of construction filler material used by ancient Maya to level the terrain has been found, as well as 5 different floor levels covered with stucco that reach the base of El Castillo south staircase. Conservation state of the substructure is good, declared archaeologist Cobos, because it was covered and sealed during Prehispanic times, using limestone and lime. Once sealed, terrain was leveled and covered with a stucco floor, over which the new construction was built. The possibility of knowing new architectonic groups such as this substructure would reveal that ancient dwellers were constantly looking forward to outstand from other social groups for political, economic or social reasons. The finding was not casual, it responds to an excavation program that parts from topographical register and excavation units, in which 4 by 2 meter wells have been dug, with 4 meters depth. Excavations will continue until September 2009. Cobos concluded that research continues in a yard-gallery at structure 2D6, to the north of Templo de los Guerreros, as well as the reconstruction of the great wall that surrounds the great level of the archaeological zone. For the latest developments on the excavations at Chichen Itza, see the American Egypt Daily Blog.